SERENATA. Nº 84 HASTA NUNCA AMOR 1959. CANCIONES MADALENA IGLESIAS. REVISTA JUVENIL FEMENINA. EXACTAMENTE EL LOTE DE LA FOTO. EN EL REVERSO SE INCLUYE FOTO Y LETRAS DE CANCIONES DE GRANDES CANTANTES DE LA ÉPOCA. SERENATA. Nº 5 ¿ADONDE VAS AMOR? 1959. CANCIONES RAMÓN CALDUCH. REVISTA JUVENIL FEMENINA. SERENATA. Nº 32 ESCÚCHAME AMOR. 1959. CANCIONES TORREBRUNO. REVISTA JUVENIL FEMENINA. SERENATA. 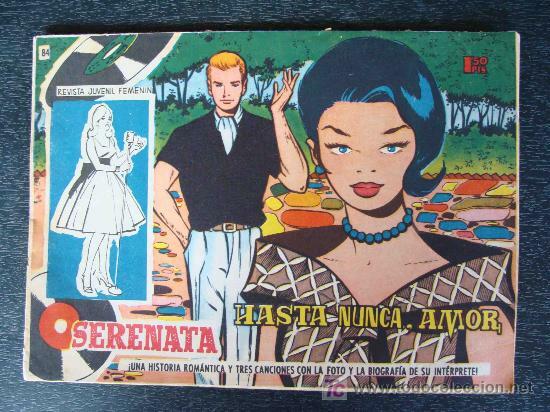 Nº 51 PROMESA DE AMOR 1959. CANCIONES ELDER BARBER. REVISTA JUVENIL FEMENINA. SERENATA. Nº 100 ESO QUE LLAMAN AMOR 1959. CANCIONES FABIÁN . REVISTA JUVENIL FEMENINA. Hora oficial TC: 14:00:08 TR: 113 ms.